Did an actor get special treatment from the LAPD? In a story that seems to have made news everywhere — except right here in Los Angeles — actor Jeremy Piven allegedly doored a bike rider when he flung his car door open without looking after parking his Cadillac near the Grove. Yet despite the rider suffering a serious chest injury, Piven escaped without so much as a ticket because the police didn’t see it happen. Even though CVC 22517 makes it clear that it is the driver’s responsibility to open a door only when it is safe to do so. No person shall open the door of a vehicle on the side available to moving traffic unless it is reasonably safe to do so and can be done without interfering with the movement of such traffic, nor shall any person leave a door open on the side of a vehicle available to moving traffic for a period of time longer than necessary to load or unload passengers. Which means that if the rider was hit by the door, the driver was at fault. Whether or not anyone saw it. A bicyclist suffered major injuries in a crash on PCH in West Malibu Wednesday afternoon; the rider reportedly lost control and swerved into the path of a pickup in the northbound traffic lane. Thanks to James Johnson for the heads-up. Great piece from Scientific American relates the story of the researcher who finally unlocked the secrets of why a bicycle remains upright and able to balance itself even without a rider; next on his agenda is trying to solve the terrifying speed wobble. Meanwhile, physics suggests that stopping and starting with both feet on the pedals is more efficient than pushing off with your foot. A Chinese bike rider somehow miraculously dodges a barrel-rolling van. Twenty-four-year old Frenchman Julian Alaphilippe is making an impact at the Tour de France, while Nairo Quintana is unexpectedly struggling. Five riders could still make the podium in Paris, but no matter what happens behind him, Froome seems to keep his hold on the yellow jersey. Peter Sagan will be the world’s best paid pro cyclist after jumping teams next year; he’s reportedly earn $6.6 million. He’s worth it in movie take-off videos alone. 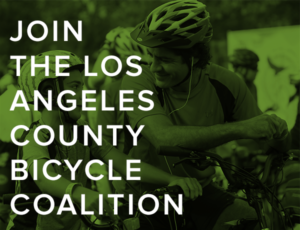 Investing in Place calls Metro’s upcoming transportation ballot measure a huge leap for walking and biking in Los Angeles County, while recapping just what advocates were able to win in negotiations over the measure. 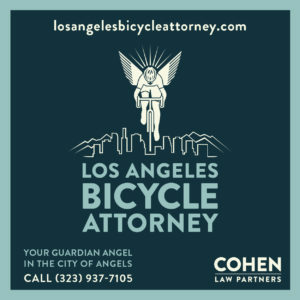 Streetsblog interviews CicLAvia Executive Director Romel Pascual. KPCC examines whether it’s better to ride a bike or drive in polluted air. 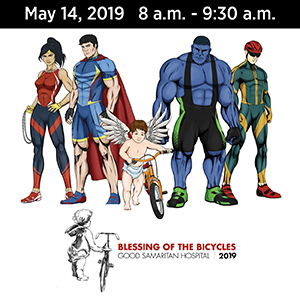 CiclaValley reminds us that the annual Tour de Laemmle rolls this Sunday. An employee with the LADOT Bikeways Program describes her multimodal commute to work. 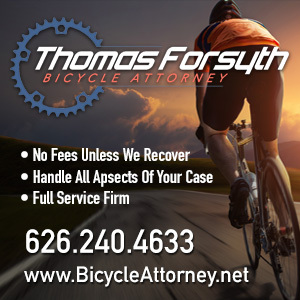 LA cyclist Nick Brandt-Sorenson, aka Strava’s Thorfinn-Sassquatch, was due to be sentenced Wednesday to up to a year in prison and a $100,000 fine for peddling performance-enhancing drugs, just days after receiving a lifetime ban from US cycling’s governing body. The Daily News says you’re a step closer to being able to ride your bike from Canoga Park to Griffith Park. Only one of which actually is one. Bikeshare and ebikes factor into California’s aggressive zero emissions goals. New bike lanes are planned for West Newport Beach, along with improvements to sidewalks and landscaping to encourage people to walk and bike. Garden Grove’s draft Active Transportation Plan envisions a city where cars, bikes and pedestrians can move in harmony. Authorities say 25-year old Zachariah Doll was wearing dark clothing, had no lights or reflectors on his bike and was riding salmon when he was killed in an early morning collision in the Riverside County town of Winchester last week. A San Francisco survey shows most drivers want protected bike lanes, too. Calbike is hiring a Communications Director to work in their Oakland office. Pleasanton cyclists call on the city to improve a dangerous intersection where a 72-year old woman was killed recently while riding in the crosswalk. Redding police arrest a junkie bank robber who tried to make his escape by BMX bike. A new report from NACTO says that as cities build bike infrastructure, the rate of bicycling goes up while the risk to riders goes down. If you build it, they will come. A real estate website says the belief that Millennials are eschewing suburbs ain’t necessarily so — as long as those suburbs have good sidewalks and bike lanes. An 81-year old Denver driver who kept driving after fatally striking a 14-year old boy standing in a bike lane was still allowed to behind the wheel despite a previous hit-and-run last year — even though family members promised she wouldn’t drive anymore. It’s up to family members to keep older drivers off the road when they can no longer drive safely, since the government is unable, or unwilling, to do it. Apparently, a Dallas bank was robbed by a bike-riding pirate. Apparently taking a cue from Donald Trump, Skokie IL will allow residents to build fences up to ten feet high along a new bike path. No word on whether Mexico will pay for it, however. Atlantic City police arrested an alleged serial hit-and-run driver for DUI after he crashed into a street sign, followed by a cyclist, followed by a car, before finally coming to rest after striking a toll booth. Fortunately, the bike rider only suffered bruises; no word on whether the sign, car and toll booth survived. A New York driver faces 136 years behind bars for killing one man and injuring two others when he smashed into a business at 50 mph while high on meth; a bike rider was also injured by flying debris. When Charleston SC approves a controversial bike lane over a local bridge, the local paper approves of their approval. Bighearted Alabama cops buy a new bicycle for a child after he unintentionally bought a stolen bike with his $7 allowance. Only 850 miles of the planned 3,000-mile East Coast Greenway are currently ready to ride; plans are for 95% of the off-road bike path to be completed by 2030. Bikes are enjoying a renaissance and bridging class barriers in Santiago, Chile. Vancouver finally rolls out a delayed and truncated bikeshare system, with just 260 of the promised 1,500 bikes currently ready to ride. Like bikes that pass in the night, a single speed cyclist seeks a fixie rider she met under the Thames. More anti-bike sabotage in the UK, as someone strung fishing wire neck high over a popular Belfast bike trail. An Indian computer professor was forced to abandon a long-distance bike tour across the country due to illness after riding 2,200 miles in 23 days. Singapore becomes the next city to embrace bikeshare with a 1,000-bike system using 100 docking stations. Call it Fifty Shades of Bicycles. Don’t ride your bike off a cliff into the ocean, bro. And if you’re carrying stolen credit cards and a meth pipe on your bike, ride your damn bike on the right side of the road.